During a conference call between USB analyst Colin Langan and President & CEO - and former Chief Engineer at GM for Chevy Volt - of Auto Lectrification Jon Bereisa about the evolution of lithium-ion batteries, Jon estimated that Tesla's Model 3's battery pack costs $260/kWh versus GM's Bolt at $215/kWh (due to GM sourcing the cell at-cost from LG). And Model 3 would be heavier and not profitable mainly due to its aluminium body. Jeff Evanson, VP Global Investor Relations at Tesla Motors, then dialled in between Q&A's to clarify on Jon's statements that the Model 3 will be partially made of aluminium and its battery pack will be smaller than the 60kWh Jon estimated thus driving the costs of making it down. He went on to mention that the Model S' battery pack costs less than $190/kWh already today. Earlier this month, we shed light on Model 3's new battery produced at their Gigafactory. During a presentation at the International Battery Seminar last month, Tesla Director of Battery Engineering Kurt Kelty mentioned a new and different larger size cylindrical cells optimized for electric vehicles unlike ever before. 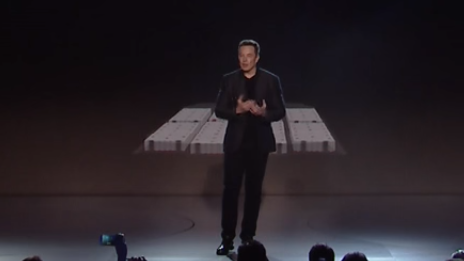 During Elon's unveiling presentation of the Model 3 you can see a 3D Cad rendering of the Model 3 battery cells with 8 modules which look bigger and different than the Panasonic 18650 battery cells used on the Model S & X forming 14 modules. Which might explain why Model 3's battery size is smaller than 60kWh and priced cheaper by 2018. - Energy consumption reduction: reducing the energy used to produce these batteries through improved and optimized material flow, raw material energy consumption per kWh reductions and heat compensation management. - New cell format: reducing the amount of dead packaging materials required per kWh and the number of connections needed to build packs while simplifying the battery management system. - Recycling: recovering the metals in cells. Cost reductions will also come from bringing the supply chain closer, from vertical integration and by optimizing processes. Currently lithium ion batteries have shown a 5-8% improvement in performance annually. Tesla is expected to achieve a 5-8% annual reduction on an ongoing basis, which is consistent with the rest of the industry. It's so sad that they destroyed the beautiful design of old Model S too. I personally don't like the design of the new model 3.